THE Bulawayo woman who was recently mauled by her landlady’s five dogs yesterday relived the horrific attack saying she could hear the sound of her flesh being torn off by the vicious canines. They tore off flesh from Ms Cherish Muchegwa’s arms, legs and behind on March 10 at a house in West Somerton suburb. She now needs about US$25 000 for a series of operations. 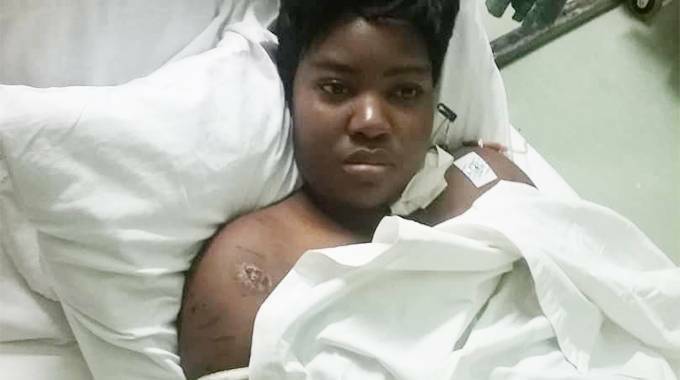 In an interview at the United Bulawayo Hospitals, Ms Muchegwa (25) described how the decision to go back home after dropping her son at her parents’ home before following her husband, Mr Joseph Masaiti, to church nearly turned fatal. “When they reached me one of them went for my arm and pulled me down and the others pounced on me and they started ravaging me. I think they were hungry because they clearly wanted to kill me. They tore off my clothes and I was completely naked as they bit me. “I could feel and hear my flesh being torn off and teeth crunching my bones as they ravaged me. I tried to fight them off with all my strength but I was no match for them. I somehow had the instinct to use my hands to protect my neck because they wanted to go for my throat to end my resistance. The pain I felt as they ate me alive is indescribable. I am alive by the grace of God, “said Ms Muchegwa. She said she is grateful to her neighbours as they came to her rescue after hearing her cry for help. “I screamed as the dogs were attacking me. No one came to save me at first but I kept fighting and screaming and as I was passing out I saw one of my neighbours rushing towards me. In the end I think two of my neighbours managed to beat the dogs with sticks and stones. I think one was bitten on the arm and the other on the leg. I am forever thankful to them, they saved my life by putting their lives at risk. The Chronicle tracked down one of the brave rescuers, Mr Godfrey Mpofu, who revealed that he is haunted by the sight of the dogs tearing his neighbour apart. “I am the first person who responded to the screams from the young lady. I was in my fowl run when I heard her screams and shouts for help. The strange thing is that I always go to the Roman Catholic Church on Sunday, but on that day I didn’t go. “I told my wife and daughter to go without me and now when I think about it I think it was God’s doing. I breed free range chickens so on that day I was feeding my chickens when I suddenly heard my neighbour’s dogs barking and growling and then my dog and dogs from other houses started barking. “Then I heard a scream and someone crying for help, saying she was being killed by dogs. “I then knew that my neighbour’s dogs were attacking someone. I had to move quickly as I knew they were killing her because her screams were subsiding. “As I was jumping the wall I was shouting that she should climb a tree to save herself. One of the dogs came after me and I had to jump back to my side. I then ran out the gate, calling out the neighbours to come and help me rescue her. But I could not wait for them to come out of their homes because if I had waited the dogs could have killed her. I went through the gate and saw the dogs dragging her and tearing her clothes while others were chewing off her flesh and eating it and going back for more. She was half naked at that point. “I threw stones at the dogs but they were not relenting. Two came for me and I tried to use a tree branch to fight them off but one of them managed to sink its teeth into the branch and the other one bit me on the leg. My plan was to fight off the dogs and carry her out the yard but someone closed the gate and I was shouting and asking why you closing the gate, you want us to die caged in here! “Eventually one person, another neighbour called Banda came and we managed to fight them off her. By the time we fought them off she was completely naked, her clothes were torn to shreds, even the tight and underwear she had on were gone. Those dogs were not biting; they were eating her, they wanted to devour her. That girl is lucky to be alive,” said Mr Mpofu. He refused to confirm reports that the five dogs, which have been put down by the Society for Prevention of Cruelty to Animals, had a history of terrorising not only the people who live with the owner — a Mrs Rhoda Mlalazi – but also neighbours. “I don’t want to talk about the history of the dogs, let sleeping dogs lie. What I can tell you is that they were cross breeds. My dog is a cross breed but after what happened I fear cross breeds and I had to give it away to SPCA. Since that day my dog was acting strangely, I think it was disturbed by the incident. I don’t know but maybe it was the smell of human blood,” he said. Neighbours who spoke on condition of anonymity said the dogs had in the past bitten over five people, eaten 25 of Mr Mpofu’s free range chickens and 32 rabbits belonging to another neighbour who was not available for comment. Mr Danacious Mlalazi, the son of Mrs Mlalazi said: “If the dogs did all that then the neighbours should have reported that to the police, the council and SPCA. Government has facilitated free local treatment for Ms Muchegwa. The Ministry of Health and Child Care came in after Bulawayo Provincial Affairs Minister Cde Judith Ncube made an appeal for Ms Muchegwa to get assistance. She is being treated at the United Bulawayo Hospitals. Ms Muchegwa needs $25 000 to undergo a series of operations in South Africa or India. In an interview yesterday, Minister Ncube said the Ministry of Health and Child Care had seen it fit for Ms Muchegwa to get free treatment while funds are being mobilised for her to travel to South Africa for surgery. “I have spoken to the perm sec and we are looking into other ways of assisting. We are trying to help mobilise funds for her treatment because what befell her is really unfortunate and was a traumatic experience for her. It is a miracle that she survived,’ said Minister Ncube. Family spokesperson Pastor Itai Ukama yesterday said Ms Muchegwa had started receiving free treatment at the United Bulawayo Hospitals. “The minister has asked the hospital for a waiver of fees on the patient. We are encouraged by the fact that she’s still reaching out to the corporate world as well as the government for more assistance both locally and in Harare. Truly the Minister has been of great help and comfort to us in this difficult time,” said Pastor Ukama. Chronicle is in possession of Ms Muchegwa’s pictures, but cannot publish most of them as they may be distressing to those of a nervous disposition.